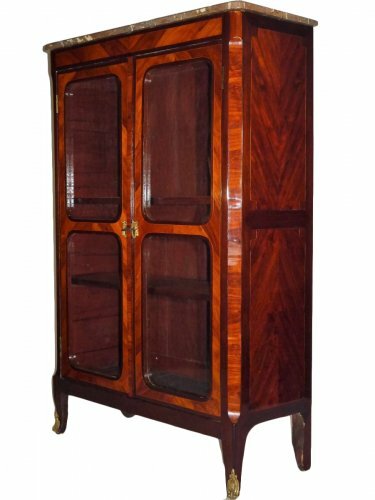 AnticStore > Catalogue > Furniture > Bookcase & Vitrine > Louis XVI > 18th century > Louis XVI mahogany vitrine or bookcase, stamped Stöckel. 18th century. 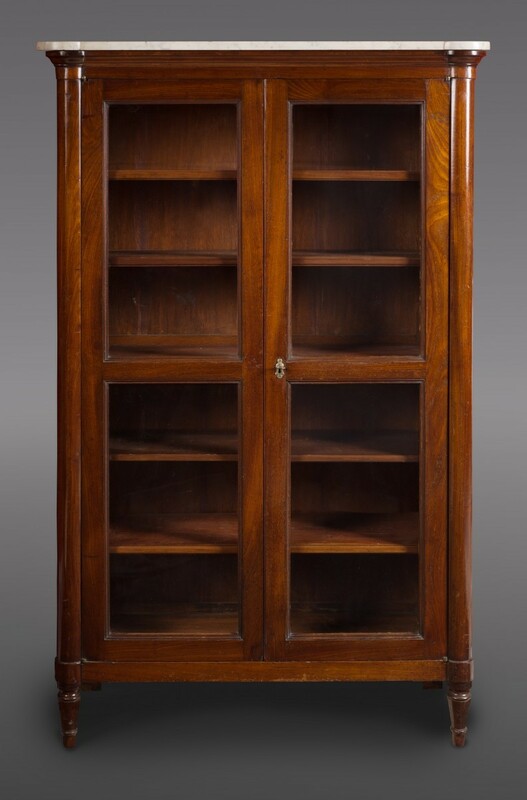 Double door vitrine / bookcase with glazed doors, retaining the original glass and 5 shelves. Solid mahogany with a grey veined white marble top. 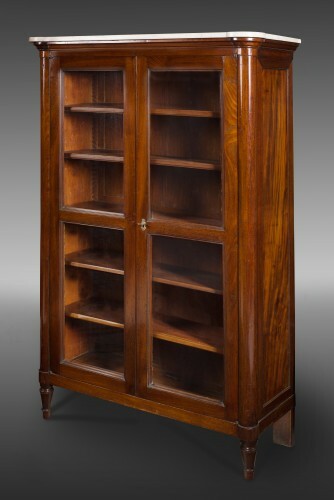 It has a fine and delicate molding, the angles of the uprights are composed of engaged columns, and it rests on four turned mahogany feet adorned with simulated hooves. 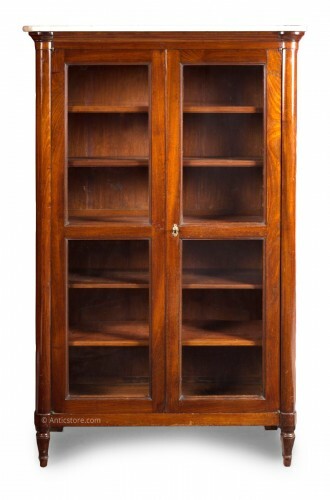 Remarkable finish and very good original condition. Born in Germany, mentioned in Paris in 1769, Joseph Stöckel worked rue de Charenton until the Revolution, then rue des Fossés-du-Temple. Among his clients are a number of prestigious merchants, important courtiers and members of the Court such as the Comte de Provence, brother of the King and future Louis XVIII. 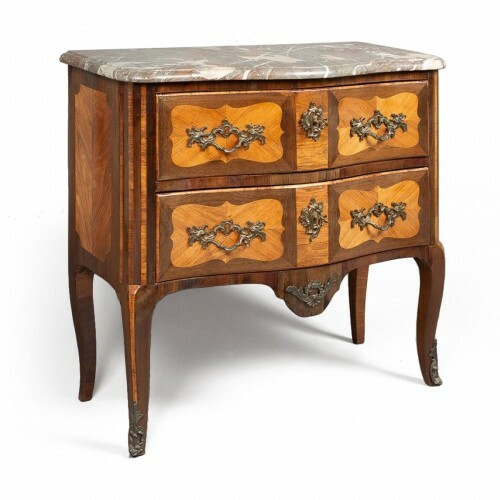 He will make for the Comte de Provence four dressers, that Guillaume Benneman will transform and copy to make eight new pieces of furniture, today preserved in the castles of Fontainebleau and Compiègne and in the Louvre museum. The study of Joseph Stöckel's production highlights several characteristics : his furniture is Louis XVI style, mostly mahogany and mahogany veneer, some rosewood veneer, rare marquetry. There are characterized by powerful forms, rather massive and rigorous lines. The large veneer sheets are surrounded by fine bronze frames or fine moldings that emphasize the quality of the wood used and sometimes draw on the front of the furniture, a circle or a wide arc. Three of the dressers transformed by Benneman today preserved in the castle of Fontainebleau present this disposition in an arc of circle which probably appeared on the furniture of origin. 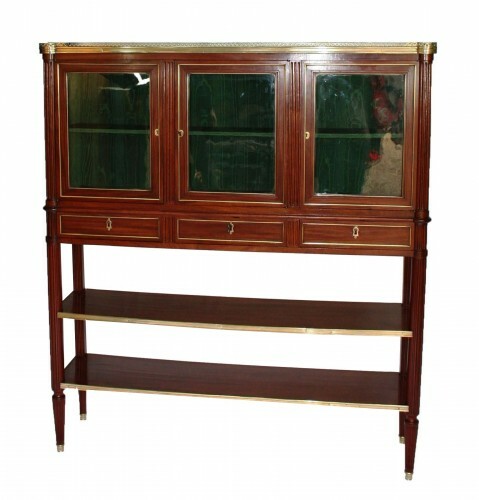 A large mahogany desk by the same cabinet maker belongs to the National Assembly. This desk was executed around 1785 for the Comte de Provence. A equivalent desk was part of the famous Jacques Doucet collection (sold by auction house in Paris from June 5 to 8, 1912, no. 129). All the furniture of this cabinetmaker show extreme care and attention to detail and perfection. Coming from the bookcase and even the dressoir, the VITRINE appeared at the Louis XVI period (1774-1785). It will be the object of a wide variety of variations depending on the nature of the objects with will be exposed. 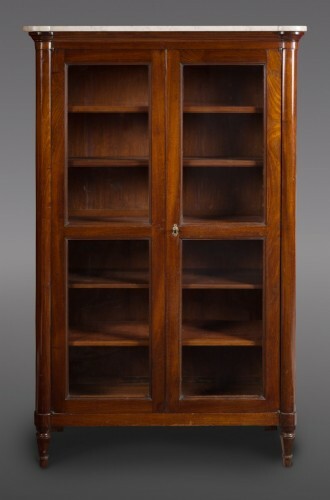 It is a small cabinet, very sober, opening with two glass doors revealing the small collectibles exhibited. 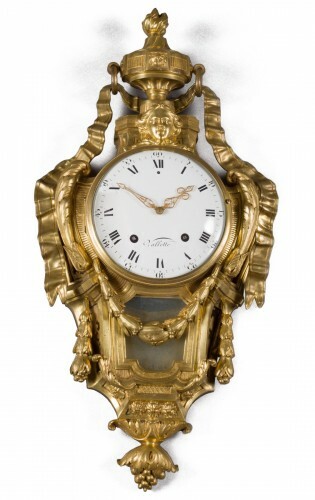 The refinement and the preciousness of these objects are highlighted by the very discreet ornamentation of the vitrine. The more precious the collections presented, the more sober the furniture was. 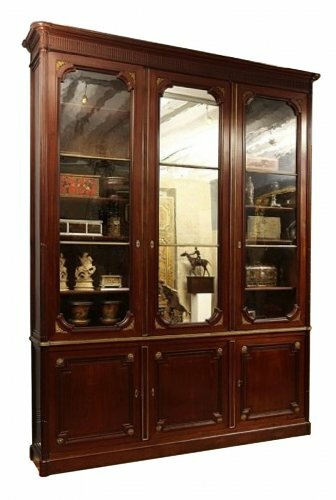 This vitrine is perfectly characteristic of its period and its maker. It presents lines and finishes of a power and discretion characteristic of the production of Joseph STÖCKEL and necessary for the presentation of a remarkable collection. 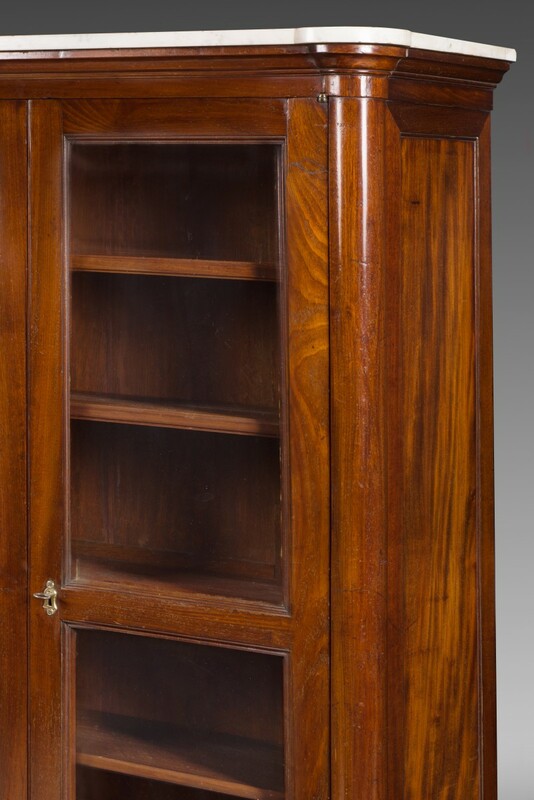 He chose mahogany, his favorite wood, for his dark and discreet character highlighting the collector's items, but also for its status as a fashionable material. 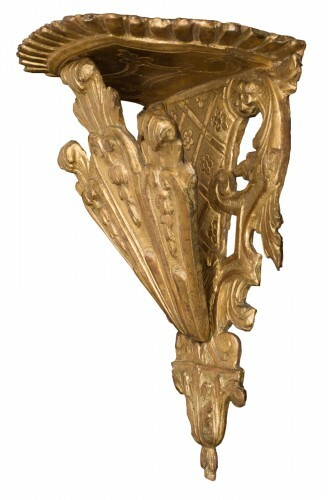 He worked it in solid wood, following lines of a strict neoclassicism, renouncing entirely to the bronzes to prefer to them a work of molding of a great finesse, thus proposing a piece whose refinement has equal of only the sobriety.
. Paris, Musée du Louvre, Mahogany commode, and mahogany, amaranth and rosewood veneer, gilded and gilded bronzes, white marble. Executed for the Comte de Provence by Stöckel and restored by Benneman under the direction of Jean Havre for the room of King Louis XVI at the castle of Compiègne.
. Paris, Musée des Arts Décoratifs - Mahogany commode and mahogany veneer mottled gilded bronze, white marble.
. Paris, Musée des Arts Décoratifs - Cabinet secretary in mahogany and mahogany veneer, gilt bronze, white marble.
. Fontainebleau, château - Mahogany commode decorated with painted porcelain plates, biscuits, carved and gilded bronzes, white marble. Dresser of a pair, the Queen's room and Grand salon of the Empress, "à l'Amour comédien", by Stöckel then transformed by Benneman. Mark of the castle of Saint-Cloud.
. Fontainebleau, château - Mahogany commode decorated with painted porcelain plates, biscuits, gilded and gilded bronze, white marble. Dresser of a pair, the Queen's room and Grand salon of the Empress, "au Confident", by Stöckel then transformed by Benneman. Mark the castle of Saint-Cloud.
. Compiègne, château - Chest of drawers in mahogany, mahogany veneer, gilded bronzes, veined white marble. Executed by Stöckel and restored by Benneman under the direction of Jean Havre.
. Bordeaux, Musée des Arts Décoratifs - "Table à la Tronchin" in mahogany and mahogany veneer, leather and gilded bronze.
. Bouges, château - Mahogany writing table.
. Talcy, château - Mahogany writing table, gilded bronzes. Classified as an Historical Monument on March 23, 1946.
. London, Victoria and Albert Museum - Rosewood veneer commode inlaid with three oval medallions framed with bronzes, friezes of foliage, simulated fluted posts.
. Aylesbury, Waddesdon Manor - Mahogany writing table, mahogany veneer, marquetry, gilded bronzes, leather.
. Aylesbury, Waddesdon Manor - "Cartonnier" with exotic wood marquetry, ornamentation of chiseled and gilded bronzes.
. Jacqueline du Pasquier, Catherine de Gabory et Michèle Seurin, Mobilier bordelais et parisien, Bordeaux, musée des Arts Décoratifs Inventaire des collection publiques françaises, 41, R.M.N., Paris, 1997.
. Geoffrey de Bellaigue, The James A. de Rothschild Collection at Waddesdon Manor – Furniture Clocks and Gilt Bronzes, Volume II, Published for the National Trust by Office du Livre, 1974.